But I do have two complaints. First, which is worse: 10 fires that destroy 1 home each, or a single fire that consumes 100 homes? You know the answer. The number of fires is a poor indicator of fire trouble, it’s the total acres burned that tells the story. Second, comparing this year to a single year from the past — and a cherry-picked one at that — is either dishonest, amazingly stupid, or both. You make the call. All of a sudden George Will’s “a third fewer U.S. wildfires in 2012 than in 2006” seems like a blatantly misleading indicator. That’s because it is a blatantly misleading indicator. The 2012 tally of acres burned is one of the highest on record. And even if it weren’t there is still an evident trend. Remember trend? The trend is up — average acres burned by wildfire has more than doubled in the U.S. in just a few decades. But George Will will have you believe that there isn’t any problem at all. Are the number and severity of fires determined by climate change rather than forestry and land-use practices? 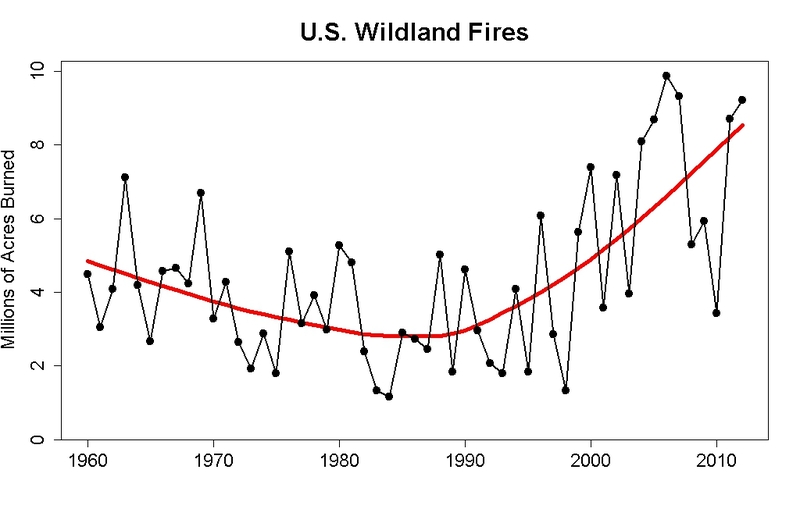 They make it quite clear that their study indicates it’s not just land-use changes, ecological factors, and fuels management that have led to what they call the “sudden” and “marked” increase in wildfire activity. In fact, they note the greatest increases in their data are in regions which are not greatly affected by these factors. They point to the culprit as increased spring and summer temperatures and an earlier spring snowmelt. And the cause for these is clear: global warming. Perhaps George Will doesn’t know the truth of the matter. I’ll lay odds that he doesn’t care to know the truth. That won’t stop him from pretending to, so he can push his agenda. Even if he does know the truth, he doesn’t care to admit it. Horatio, please do me a favor–and Tamino, if you wish, after this missive gets to Horatio, feel free to delete it–but I cannot otherwise find a way to contact you, and I NEED a song written..;) Drop me a line at harwig57 at gmail dot com. When I first saw this in my RSS feed, I thought it was Dog House Riley, the usual George F’ing Will correction and thrashing machine. How refreshing to have someone else take this old lying sack to task. You might also look at the international incidence. I’m not sure how this plays out, but certainly there’s been an increase in Siberian wildfires (many of which are so inaccessible a count may be problematical) and a lot of smoke made its way to the northwest, affecting air quality. Then there’s Australia … the Mediterranean. If I were a good girl with time on my hands I’d take a look at Earth Observatory. I have a feeling the overall picture is rather daunting. This, while local, is rather fascinating (Siberian expedition). I can’t help thinking the Arctic fires have disproportionate dangers, as does the disappearance of large swathes of the huge Amazon rainforest, much of it due to development and exploitation. Australia has had an awful lot of fires this summer. Queensland has also had an awful lot of rain (again). And Sou, you are right, the “skeptics” over here do want more land clearing and controlled burns. The problem with controlled burns is that the window when you can safely do them is pretty small. A big fire in Western Australia in November 2011 was actually a controlled burn started in September (read March for the northern hemisphere equivalent), but got out of control. The question for you Tamino is, if fake skeptic GW deserves your attention. But thanks for the post, as always! Oh come on! It’s his job to write ridiculous claptrap. I have read Will’s climate columns over the years. He appears not to understand science, math, or statistics. It’s hard to tell if he’s dishonest, ignorant, or both. He’s at least one of them. Will could have done a 2 minute Google search to get an answer to this. He is either profoundly and willfully ignorant or as dumb as a box of rocks. Being a geologist I know exactly how dumb a box of rocks are. PFD. OK, I just read his editorial. I stand corrected. He is in fact both. Will is an idiot. Why any newspaper carries his columns is a mystery to me. On the eve of this past election, he was predicting a Romney electoral landslide that included Minnesota. If I was so piss-poor at my job, I wouldn’t be able to keep it. Is there some sort of “affirmative action” (in the worst sense of the word) for conservative commentators? Easy: because they have idiot readers! Because they have “conservative” advertisers. Newspapers want to provide “balance” on their editorial page. It’s extremely difficult to find conservative pundits in the US these days who understand (or, at least, accept, in public) science so they’re stuck with the likes of George Will. Who doesn’t really understand baseball, either. But— that would be un-American! These days not understanding football would be Un-American. Not understanding baseball? Un-Cuban! …aside from not watching it at all, that is, which is unfinity-American. I wonder whether Will notices that the years he cherry picks are suspiciously similar (98/99, 05/06) whenever he writes one of these stories regardless of whether he’s writing about temperature (no global warming since people graduating college entere Kindergarten! etc) or a phenomena he’s claiming is unrelated. Also, it would be useful to pair your plot here with a similarly scaled plot of lower-48 temperatures. But is it significant? If I plot the data in Excel the r2 for a linear trend is below .2. One thing I’ve learned from this blog though is I know next to nothing about statistics. So, is the trend significant? Another point is that despite all the advances in communications, firefighting, use of aircraft etc, the area burned by wildfires keeps growing. Big fires used to occur about once every fifty years in Victoria (Australia) (eg 1939 fires, then the Ash Wednesday fires in 1983. Since 2000 it’s about every three years – 2003, 2006, 2009 – and a fairly decent burn going at the moment, though not as bad as those three at this stage. Same with floods – eg SE Queensland had a big flood in the 1970s. 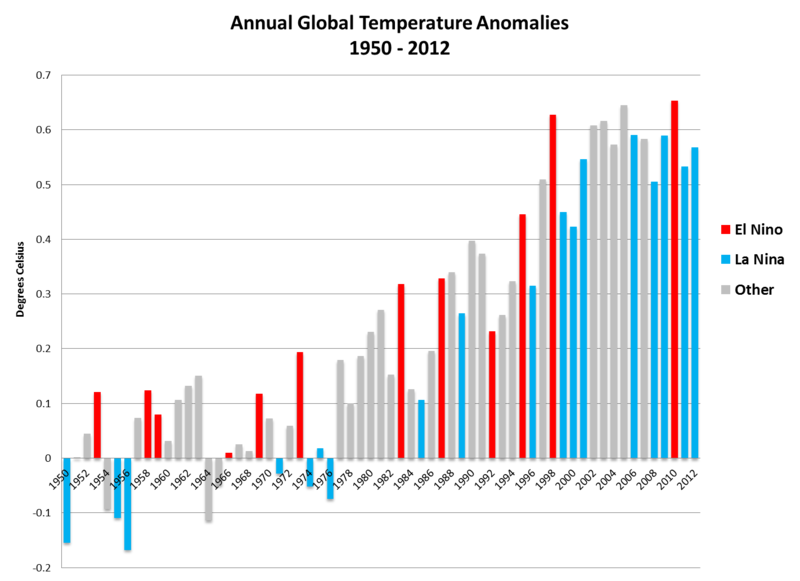 It’s now happening almost every year and the precipitation intensity keeps breaking new records. Good point. In the last week I have heard comments from both firefighters and flood victims (in oz) that they are far better prepared than previous disasters, The firefighters said they are now much more prepared to spot and put out the fires while they are small, and the previous QLD floods have lead to earlier warnings to citizens. Not sure these advances are factored into scientific papers (which is fair enough because they are hard to quantify, but the effect is that we are likely to underestimate the increase in such threats). I’d say Will regards himself as a stalwart defender of Liberty and the Free Market, against reality’s well-known liberal bias. I doubt he knows many principled scientists well. In his world, rhetoric makes reality, and he’ll keep up the rhetoric until Freedom wins. Will argues by leaving a resonant question unanswered. Isn’t that the strongest indicator you know of someone being a wife-beater? If I do a simple linear regression of acres burned vs. year for 1983 to current (using data from the link provided by Diana Prechter) I get an R^2 of about 0.48 and a P-value of <0.0001 (used JMP from SAS Institute for the analysis). "Strongly statistically significant" does indeed seem to apply to this trend. Similar analysis of # of fires vs. year is much less significant, and loses significance (P = 0.58) with elimination of 1983 and 1984 (numbers seem unusually low for those two years relative to what immediately follows). The regression of acres burned vs. year remains significant (R^2 about 0.41, P = 0.0003) with elimination of those two years.